After a brief hiatus, I am back in 2019 with another article, this time in regards to the quarterbacks taken in the first round of the 2018 NFL Draft. This is always a hotly contested subject, especially this season with 5 going in the first 32 and the personalities involved. Below I will rank the 5 on how I feel they performed in 2018 and then offer where I think they will go from here in the future. All were thrust into duty at some point during the regular season and most, if not all, showed flashes of first round potential, mixed with some disastrous plays that have people questioning the picks already. It is important to stay patient with these young players and many will consider this to be an overreaction but all we can go off is how the players performed this season. The best record of all the first round quarterbacks was Lamar Jackson of the Baltimore Ravens. Let’s be clear, of all the five teams that took a quarterback in the first round, the Baltimore Ravens have by far the best defense and well-equipped offense to find success. However, that same roster and defense was 4-5 under former Super Bowl winner Joe Fluke-o to start the season, so something has to give, right? Jackson and the Ravens went 6-1 to close the season and finish 10-6 as AFC North Champions. I know he only completed 58% of his passes with 6 touchdowns and 3 interceptions but he added nearly 700 yards on the ground with 5 scores. So although nothing more than a game manager as a thrower, his rushing ability and youthful exuberance rejuvenated the Baltimore Ravens and made them a tough team to game-plan against. I often am skeptical of running quarterbacks because NFL coaches are intelligent and will eventually adjust the game-plan to contain Jackson (i.e. Robert Griffin III), so he will have to improve as a passer to continue to grow. This article was grading the 2018 season though, and at this point, no one has had more of a positive impact on their team than Jackson. So for right now, he’s a B+ as the Ravens get ready to host the Chargers this weekend in Wild Card weekend. Does anyone have less help of all the rookie quarterbacks than Josh Allen? Short answer is: No. Yes, the Bills defense is pretty good but outside of the football nerd and die-hard Buffalo Bills fans, the weapons on offense that Allen has to work with are total no-names. Robert Foster? Zay Jones? Charles Clay? Marcus Murphy? Give me a break. Although, Foster and Jones have developed into decent weapons in Buffalo, the Bills are lacking that elite weapon that makes defenses nervous and possibly can take Allen to the next level next season. If it’s not via trade or free agency it will be interesting to see what direction the Bills go in the draft, but we can refer to Kyle Emerson on that topic in early spring. Back to Allen, 5-6 in his opening campaign as the starter in Buffalo, with that supporting cast, is nothing to take lightly. 10 touchdowns to 12 interceptions is certainly less than ideal for the young rocket but chipping in 8 touchdowns via the ground and four games of 95+ yards rushing is an intriguing plus for Allen. A wildly inconsistent completion percentage and passer rating leaves much to be desired from Allen but he was still somehow able to manage 5 wins with all of that? 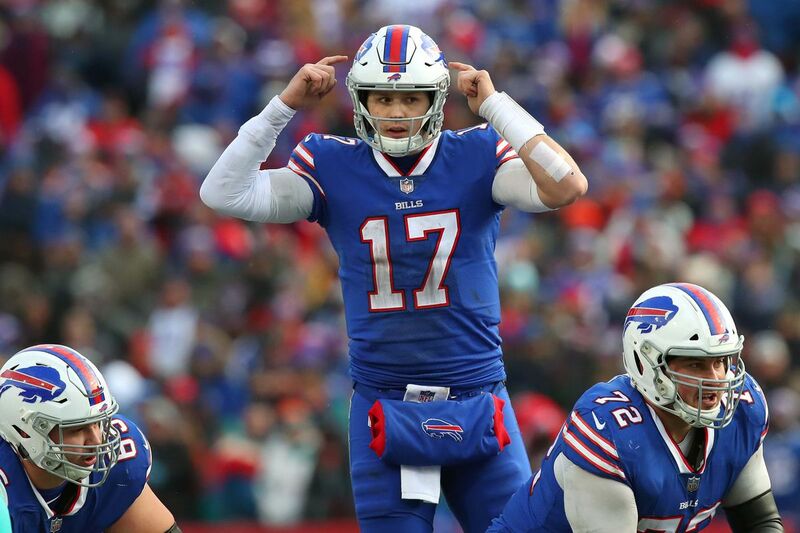 Entering his age 23 season in 2019, with 2 comebacks and 3 fourth-quarter game-winning drives already under his belt, the Bills mafia must be salivating. If he can only marginally improve as a passer next season with an offensive addition or two and an improving defense, the future is bright in Buffalo. It is hard to not say that Allen over-performed expectations as a rookie. He still is only getting a B- because of his inconsistencies as a passer, but the future is bright. The media surely would have you thinking that Baker Mayfield is already on his way to take the 1 hour road trip down I-77 S from Cleveland into Canton, Ohio after his rookie season. But let’s delve a little bit deeper into the data, some of which the Baker-apologists often don’t like to do. A 6-7 record as a starter is certainly nothing to sneeze at and he has generated a lot of buzz, that is undeniable. But with all of the glitz and glamour, and the many weapons around him, he managed only one more win than Josh Allen? Seriously? A young defense, that actually was much worse than originally thought, is still ripe with a bunch of young talent and offensive additions of Jarvis Landry and a workhorse tailback has Mayfield stock-piled with artillery. A fiery young security blanket in David Njoku has the Browns looking like they are on the come-up. But let’s look further. In Week 2, against the ever pathetic Oakland Raiders, a first quarter pick-6 was thrown from Mayfield into the hands of Gareon Conley and then on the opponents side of the field with 30 seconds to go in regulation, an inadvertent pass from Mayfield was picked by Reggie Nelson on the Oakland 14, to cost the Browns the game. So that one hurts a bit, but then against the Houston Texans, who allowed Sam Darnold to torch them a few weeks later, Mayfield threw three more interceptions and was blown off the field. Finally, in the last game of the season, Mayfield again, threw three costly interceptions including the game sealer into the hands of C.J. Mosley. 7 interceptions over the last 5 games of the season and 14 on the year is an awful lot for a guy who “never throws interceptions”, but then again the NFL is not Texas Tech. To the positives, because there are many, 27 touchdown passes, 4 fourth-quarter game-winning drives and the ability to overcome the early season turmoil with Hue Jackson are all positives for the Browns. Mayfield also scores a B- and we will see if he can continue to grow in year 2. Sam Darnold’s rookie campaign was up and down but I actually think Jets fans should feel a little more at ease than maybe they thought they would be in the middle of the season. A 4-9 record is not ideal, but neither is this Jets roster or coach or GM or stadium or well, just about everything. Four games with a passer rating over 100 to go with 17 touchdowns and 15 interceptions is okay and actually what you would probably expected out of Darnold. You expected some high turnover numbers more from Darnold than Mayfield, if anyone is wondering why I was more critical of the number one overall pick above. His two game stretch against the Houston Texans and Green Bay Packers at the end of the season brought some momentum for Darnold heading into 2019 with 5 touchdowns to zero interceptions. It will be interesting to see who the Jets add in 2019, Le’Veon Bell?, Antonio Brown? Both? Darnold will need to harness in the mistakes if he ever wants to live up to the billing as the 3rd overall pick but what was looking like a lost season for the rookie, picked up a little steam at the end. Overall a C grade for Darnold because of his mistake prone nature but with a new coach coming in 2019, there is reason for at least a little optimism in New York. Yikes. Well, that was not a pretty season for the rookie Rosen. A 3-10 record with 11 touchdowns and 14 interceptions to go along with 10 starts with under 200 yards passing is certainly not ideal for the Cardinals and Rosen. He beat the hapless San Francisco 49ers twice and a deflated Aaron Rodgers once but with David Johnson as his tailback and future Hall of Famer Larry Fitzgerald on his side, I think we expected at least a little more. Steve Wilks has been fired as the Head Coach of the Cardinals and I am sure the next man in charge will be someone that has a specific plan for resurrecting Rosen in year two. Rosen had the fifth most passes intercepted of any quarterback in football, the most interceptions returned for touchdowns in all of football and was sixth in lost fumbles among all players in football. That is not so good. He is given a D- simply because an F is almost impossible to attain as a rookie but he must show second season strides or else this experiment could be over really quickly. Thank you for reading and I hope you enjoyed. This 2019 Quarterback class does not seem as promising as 2018 so it will be interesting to see how it plays out. Expect to see many more articles in 2019 from me.